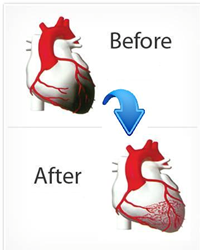 External Counterpulsation, also known as ECP or EECP, is a proven treatment for heart disease. The Heart Fit Clinic is now selling External Counterpulsation (EECP or ECP) machines with a full clinic licence to help people prevent and reverse heart disease. The Heart Fit Clinic has been in business since 2007 helping people prevent and reverse heart disease through its evidence-based integrative approach to heart health. The Heart Fit Clinic is selling clinic licenses for the Heart Fit Clinic to healthcare professionals where they can also buy External Counterpulsation (EECP or ECP) machines. The Heart Fit Clinic has been featured extensively in the media as a cardiac rehabilitation and heart attack and stroke prevention clinic. They have seen many great successes with people preventing and reversing heart disease. The best heart attack is the one that never happens. The Heart Fit Clinic provides cardiovascular screening tests that are not readily available at doctor’s offices. Over 50% of people who have a heart attack have normal cholesterol levels and the majority of heart attacks occur with blockages that are less than 70%. Conventional screening for heart disease is not enough and the Heart Fit Clinic fills this gap. Heart disease can be frightening and the Heart Fit Clinic can keep track of disease process, and have the best lifestyle treatment program along with External Counterpulsation Therapy to reverse heart disease. When healthcare professionals buy External Counterpulsation (EECP or ECP) machines they have the opportunity to use External Counterpulsation along with its extensive lifestyle program. The Heart Fit Clinic looks forward to helping more people prevent and reverse heart disease. For more information please contact the Heart Fit Clinic.